Damon And Affleck To Produce DC Comics' SLEEPER! As DC Comics scrambles to keep up with Marvel in the comics to movies race they find themselves trying to fill in the time between the Bats and Supes films with almost anything at this point. And since their other superhero properties cannot get off the ground perhaps tackling a different property is in order. Sleeper, the ten year old comic series released under DC's Wildstorm banner has changed hands numerous times. Probably the most famous to this point was Tom Cruise and Sam Raimi. 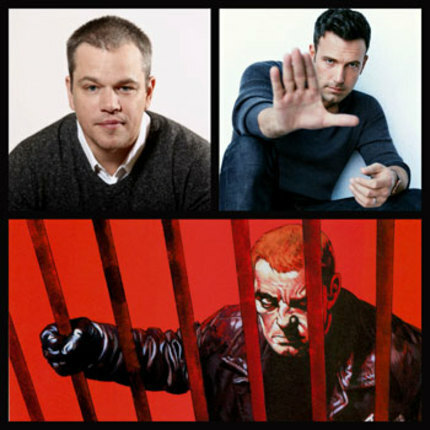 But the project has had a long gestation period and another attempt is being made by Matt Damon and Ben Affleck through their production company Pearl Street Films. Jennifer Todd, the president of Pearl Street, will also produce. "Sleeper" -- set in a noir universe where a few people are spontaneously developing superpowers -- follows Holden Carver, a man who can absorb pain and pass it on to others, as he infiltrates a criminal organization on behalf of a law enforcement agency. His allegiances come into question, especially when he falls for the alluring killer, Miss Misery. Warners has brought in writers Shawn Ryan and David Wiener to pen the adaptation. Ryan was the creator and show-runner of The Shield. Wiener worked with Ryan on the cancelled drama series Last Resort last year. He has also done some work on The Killing. No one has been hired on to direct the flick yet. No actors are attached to the project yet either. They are strictly at the scripting stage for now. But now that Affleck is firmly embedded into the DC family with his upcoming turn as Bats one would imagine that this will be a more serious attempt to turn Sleeper into a film. You've just made it into the family. You don't want to get kicked out before you've started.